PHILADELPHIA, PA – May 4, 2017– Janney Montgomery Scott LLC (“Janney”), a leading full-service wealth management, financial services and investment banking firm headquartered in Philadelphia, PA, today announced that Steven C. Victor, Senior Vice President/Wealth Management and Lisa W. Fouraker, Vice President/Wealth Management, have joined Janney’s Radnor, PA branch office as Victor Fouraker Wealth Management. They are joined at Janney by Heather S. Stahler, Private Client Assistant. 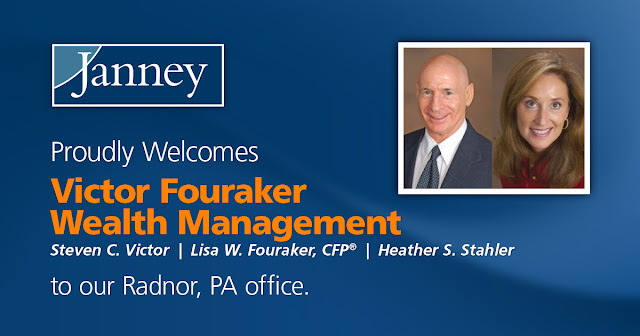 Victor, Fouraker, and Stahler were previously affiliated with RBC Wealth Management in Conshohocken, PA.
Victor, a 34-year industry veteran, and Fouraker, a 19-year industry veteran, are entrusted with nearly $175 million in client assets. Throughout his career Victor has continued to enhance his skill set by taking advanced courses on topics such as Development of Investment Policies, Asset Allocation and Investment Manager Search and Selection. Fouraker, a Certified Financial PlannerTM, Certified Investment Management Analyst®, and Chartered Retirement Planning Counselor®, received her Master’s in Taxation and Financial Planning at Widener University.